San Rafael, CA -- July 10, 2017 -- EQIS Capital, a Fee Based Turnkey Asset Management Platform (TAMP) for financial advisors, is reinventing wealth management again during an uncertain financial market environment with the introduction of its EQIS Allocation Scientifically-Engineered (EAS-E) Strategic Income Model and Dynamic Distribution Strategy. These new models complement the six existing EAS-E models that each have their own investment philosophy spanning the spectrum from strategic to tactical. EQIS is introducing two new income model portfolios: the EQIS Strategic Income Portfolio designed to generate a steady income and the EQIS Dynamic Distribution Strategy designed to sustain client distributions. Each income model portfolio consists of multiple asset managers with varying methodologies. Each portfolio consists of equity income, typically large cap companies that pay a dividend and also non-traditional asset classes that pay a dividend like REITS and utilities. The fixed income allocation will typically be a blend of U.S. treasuries, corporates, high yield, and global bonds. The EAS-E Strategic Income Model’s core is invested mostly in strategically managed domestic high yield equities, Satellite categories include ultra high yield, real estate, commodities, and specific industrial sectors. The fixed Income component is a variety of mostly strategically managed securities such as preferred stocks, foreign fixed income, domestic corporate bonds, and U.S. treasuries. Conservative, moderate conservative, moderate, moderate aggressive, and aggressive versions of the EAS-E Strategic Income Model are offered. 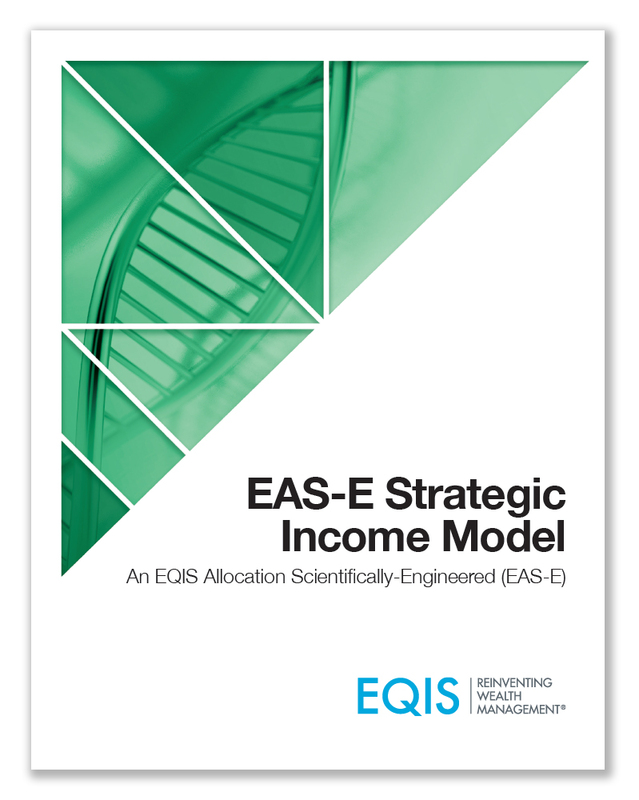 “The asset managers in the EAS-E Strategic Income Models are managed mostly by strategists but we also included some tactical money management in equity and fixed income,” said the EQIS CEO, Scott Winters. Dr. Kenneth Kim, EQIS Chief Economist and Financial Strategist said, “We want to help advisors and their clients secure reliable income. This is especially important when there is uncertainty in markets. Will interest rates keep rising? Will the U.S. market’s honeymoon with Trump continue? How will the markets handle the ongoing geopolitical uncertainty? Which way will oil prices go? Will China bring us into a global recession?” Only time will tell and EQIS now has portfolios to help investors in the asset accumulation and decummulations phases of their investing life cycle. The EAS-E Dynamic Distribution Strategy’s core is invested mostly in tactically managed domestic high yield equities. Satellite investments include ultra high yield, real estate, commodities, and specific industrial sectors. The fixed Income component is a variety of mostly tactically managed securities such as preferred stocks, foreign fixed income, domestic corporate bonds, and U.S. treasuries. An equity hedge portfolio is incorporated, designed to capture market upside but also protect on the downside. The model also has an allocation to an ultra high yield portfolio. One of the company’s strategic partners developed an innovative solution to overcome the low yield environment. They have been able to provide a portfolio designed to get double digit yield while maintaining liquidity. Conservative, moderate conservative, moderate, moderate aggressive, and aggressive versions of the EAS-E Dynamic Distribution Model are offered. The way that cash is raised for distributions is also innovative. During ‘normal’ times, the strategy will use its “Smart Distribution” methodology which uses cash on hand first, then sells securities that are overweighted according to their targets. The highest priced tax lots of each security are sold first for tax efficiency. During depreciating market conditions, the strategy will deploy “Tactical Distributions,” meaning it uses assets in the Distribution sleeve that are invested in a tactical fixed income portfolio designed for income and preservation of capital. This will be executed to prevent the need to sell depreciated assets to provide income. When the market returns to ‘normal’ times, the Distribution sleeve will replenished from the assets that have appreciated. The EAS-E Model Portfolios span the spectrum of investment philosophies - from 100% strategic to 100% tactical with four blends - and all allocations are scientifically engineered. The allocations, which are managed by EQIS, are rigorously and methodically derived, primarily based on academic theory and evidence, but also based on in-house scenario analysis, computerized mathematical simulations, and EQIS proprietary quantitative modeling. Increase their practice efficiency with easy-to-use professional asset management. Prevent clients from emotional investing with scientifically engineered portfolios. Serve clients at all life stages with portfolios made for accumulation and distribution. Help clients of all sizes and tolerances since portfolios are client-centric. Potentially provide clients with better returns and lower risk through institutional style investments. Ultimately save an advisor time to focus on client relationships.